Heaven Inn is located within Sector 43 of Noida. The rooms have been designed in a minimalist manner. 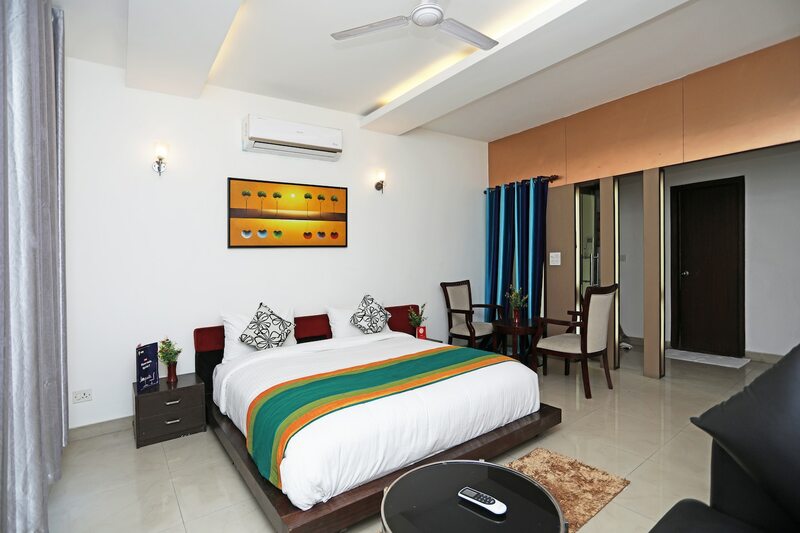 The rooms have an elegant atmosphere and have been provided with a lot of space for free movement. The rooms are decorated in a minimalist manner and have been painted in neutral hues. All rooms are well-furnished. The rooms are well-lit and the floor is tiled. Large windows have been provided in each room and they have been covered in brightly colored curtains. A set of paintings adorn the walls of the room. Every room has been provided with a set of sturdy wooden chairs and a wooden coffee table. The additional facilities provided by the hotel are free Wi-Fi, a common kitchen, a constant power backup source, parking provisions, card payment in all forms, laundry provisions, a common dining area, and CCTV cameras. The front desk service is decorated elegantly and is surrounded by a well-furnished reception. The front desk is manned by experienced staff. The hotel is surrounded by a number of restaurants such as Biryani By Kilo, 2 Bros Kitchen, Cafe Limelight, Hungry Minister, and Firangi Tadka.